Flagged off by The Hon’ble President of India, Shri Pranab Mukherjee on the 25th July 2016 the HOHO (Hop-on-Hop-Off) Bus Service has been extended upto Rashtrapati Bhavan. The HOHO Hop-on-Hop-Off Bus Service is the Official Sightseeing Bus Service of the Delhi Tourism Board and has been running from 2010. These are AC buses and have ‘Onboard’ Guides. It is a Daily One-Day Sightseeing Tour of Delhi (the Delhi Darshan Tour) there are others too and tickets can be bought from the HOHO Delhi website. It drives past more than 20 places and you can visit 9 of these. 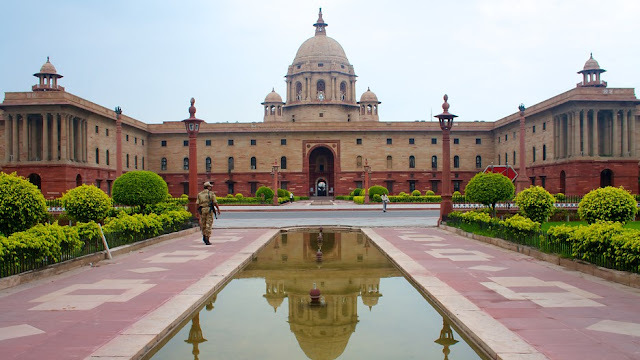 Rashtrapati Bhavan is home to the President of India. It was designed by Sir Edwin Lutyens and Herbert Baker and stands on a 330 acre estate. 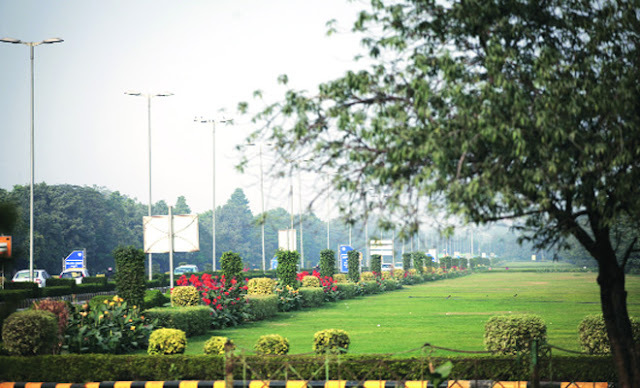 It has 5 kilometers of corridors and 190 acres of garden area. The main building covers an area of 5 acres and has 340 rooms spread over four floors. The famous Mughal Gardens of the Rashtrapati Bhavan cover an area of 15 acres and have 159 celebrated varieties of roses, 60 varieties of bougainvillea and many other varieties of flowers. 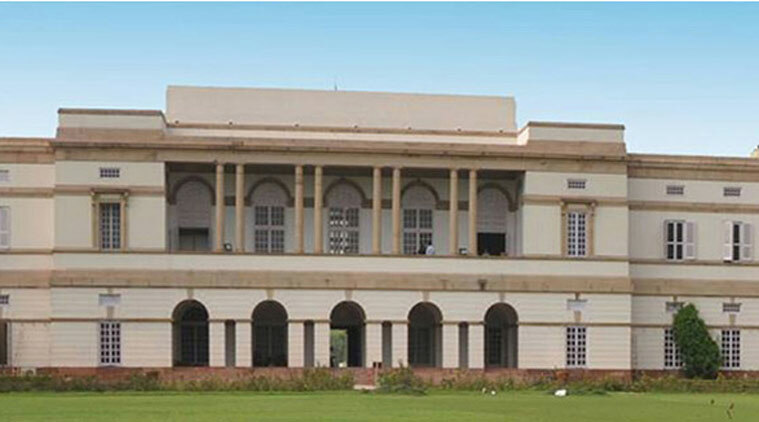 The Estate also has a state-of-the-art Rashtrapati Bhavan Museum Complex comprising the Clock Tower, the Stables and the Garages. The RBMC was inaugurated by President Pranab Mukherjee on 25th July, 2016. 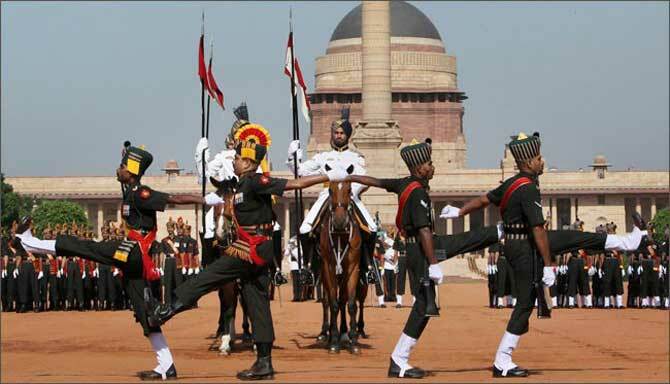 The Changing of the Guard ceremony at the Rashtrapati Bhavan is a fascinating parade with the elite President’s Body Guard on horseback and the Army Brass Band. It is held Only on Saturdays. This street houses most of the handicraft emporiums. 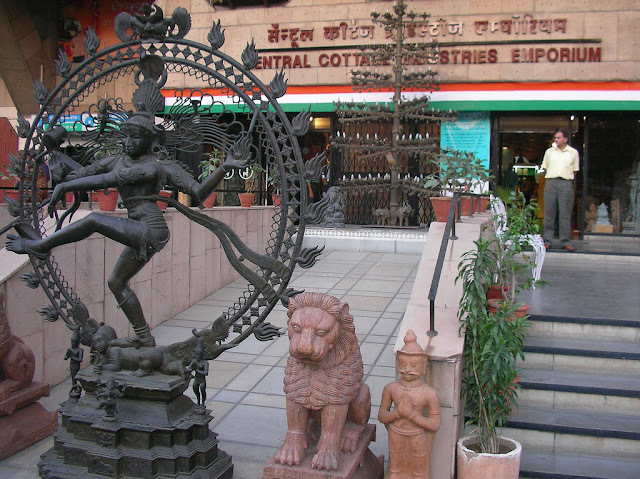 People from all parts of India and abroad come here to hunt for handicrafts at these emporiums. The HOHO Dilli Dekho Bus Service’s i-Center is also situated on BKS Marg which is the starting point of the route. 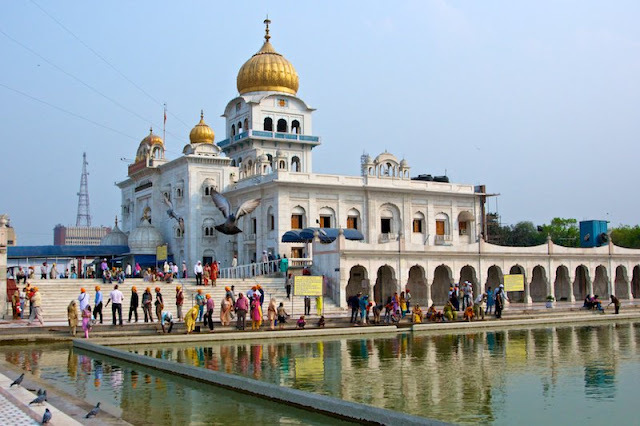 It is the most prominent Sikh gurdwara known for its association with the eighth Sikh Guru, Guru Har Krishan. 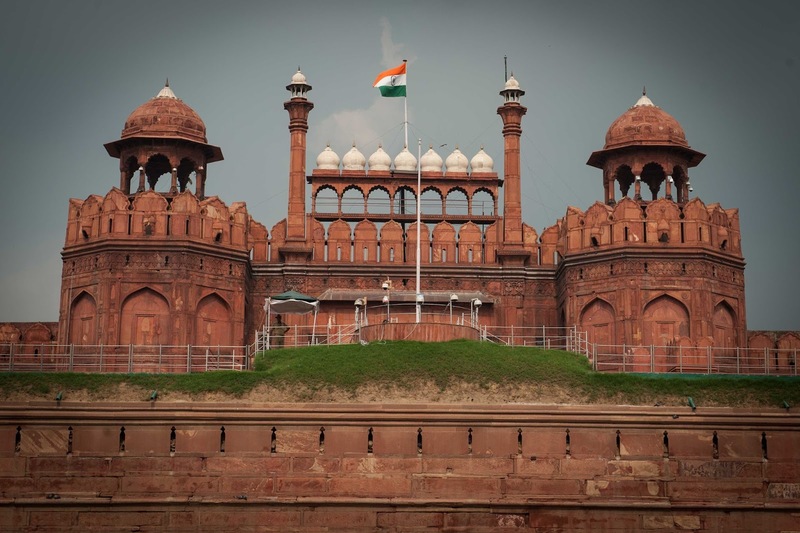 The Red Fort, popularly known as the Lal Qila, is a ‘must see’ spot for tourists. This magnificent structure on the banks of the River Yamuna is an important piece of Indian history. This fort was constructed by Shahjahan, who also built one of the wonders of the world, the Taj Mahal. The whole structure is made of red stone. Construction of the Red Fort started in 1639 and this colossal structure was completed in 9 years! It is from here that the Prime Minister of India addresses the nation on August 15. The Red Fort became a UNESCO World Heritage Site in 2007. 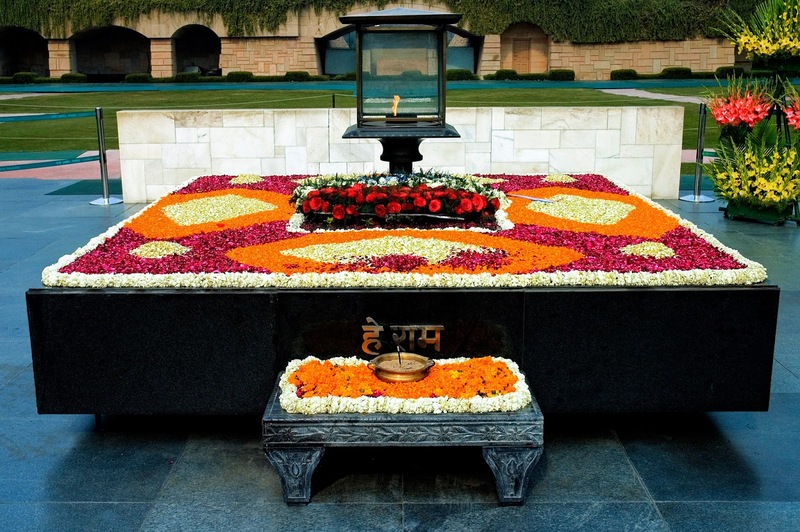 Rajghat is a simple black granite platform marking the site where Mahatma Gandhi’s last rites were performed. ‘Hey Ram’, his last words, are engraved on the black memorial stone. An eternal flame burns at the center of the stone. Prayers are held here on Gandhi’s birthday and death anniversary. Foreign leaders who visit Delhi pay their respects to Mahatma Gandhi, the Father of the Nation here at Rajghat. Almost 10,000 visitors visit this memorial every day. 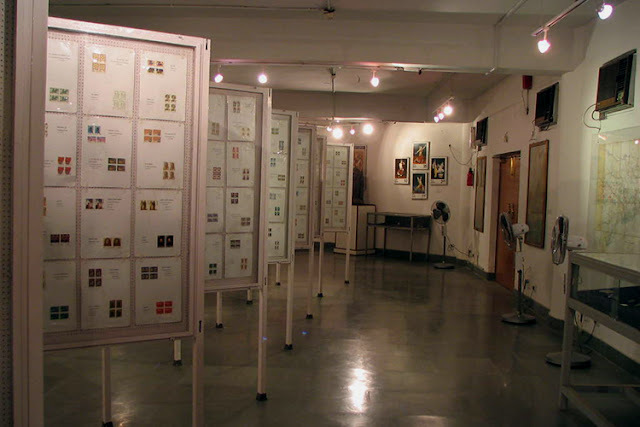 Here you can explore the history of Indian art! The former residential palace of the Maharaja of Jaipur was later transformed into the National Gallery of Modern Art. 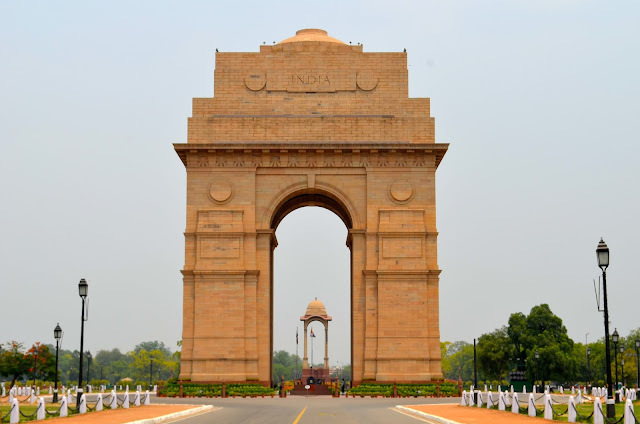 It is situated at the eastern end of Rajpath near India Gate. The Gallery has a wonderful collection of around 15,000 paintings, sculptures and works of arts by Indian as well as international artists. India Gate was built in 1931 as a memorial to the 90,000 Indian soldiers who laid down their lives fighting in the First World War. The names of the 90,000 men are inscribed on the uprights of the arch. Under the arch is the memorial to the Unknown Soldier guarded round the clock by a ceremonial guard drawn from the three wings of the Armed Forces. It serves as the venue for the Republic Day Parade. 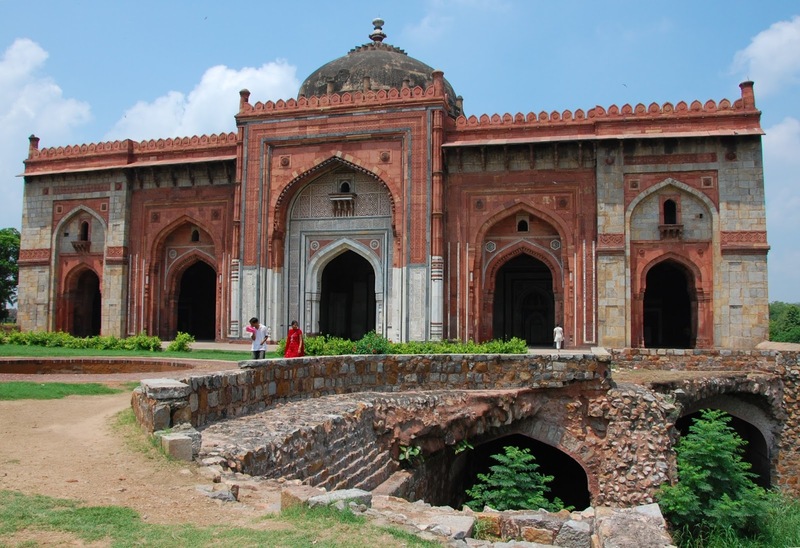 The Purana Qila was started by Humayun in 1533 AD and was completed by the Afghan ruler Sher Shah in five years. Excavations in 1955 have revealed evidences of Gupta age. The archaeological evidences established that this fort stands on the ruins of the legendary city of Indraprastha. Humayun’s Tomb was built by his widow, Haji Begam after his death. It is considered as the first distinct example of proper Mughal style inspired by Persian architecture. It was the first garden tomb built in the Indian Subcontinent. Humayun’s Tomb is a UNESCO World Heritage Site. The channels at the garden reflect the four rivers that flow in Jannat, the Islamic concept of paradise. 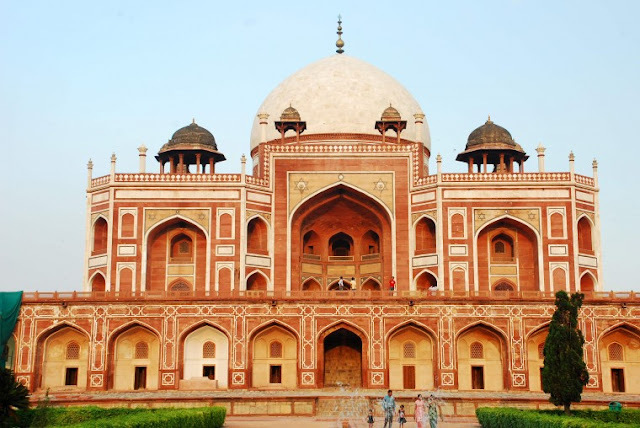 It took eight years and Rs 1.5 million to build Humayun’s Tomb. 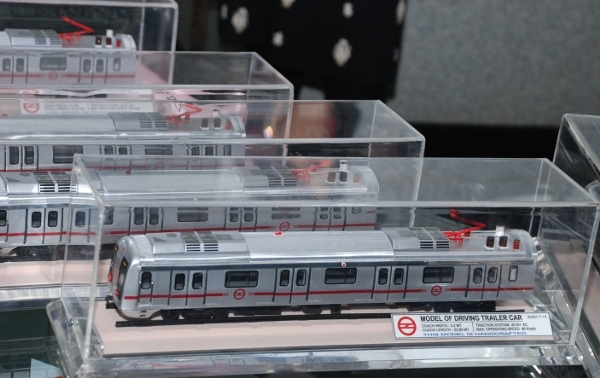 Inspired by the Transport Museum in London, DMRC has set up South Asia’s first “Metro Museum”. It was founded in 1995 but the museum was opened to the public only in December 2002 and since then it has become a favorite attraction. The museum showcases visitors the technology involved such as the Automatic Train Control System, Automatic Fare Collection system. In the museum you can see photographs and models of the metro trains and stations, etc. The museum also has two large touch screen monitors which plays presentations describing how the Metro and its stations were and are built. There is also a gift shop. The Lotus Temple is one of the most remarkable architectures of Bahai faith. This structure is considered the modern ‘Taj Mahal’. Since its dedication to public worship in December 1986, it has drawn more than 70 million visitors, making it one of the most visited edifices in the world. The place provides immaculate environment for meditation, peace. The temple has no restrictions for visitors and is open to people from all religions. The central hall of worship of the Lotus Temple has a capacity to accommodate 2500 persons at a time. 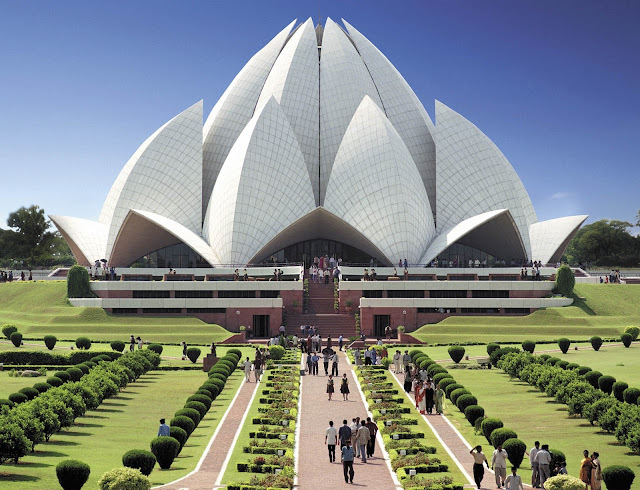 A CNN report has listed the Lotus Temple of Delhi as the most visited establishment in India. The National Philatelic Museum is operated by the Department of Posts which has a post office with an outlet for philatelists interested in Indian stamps. 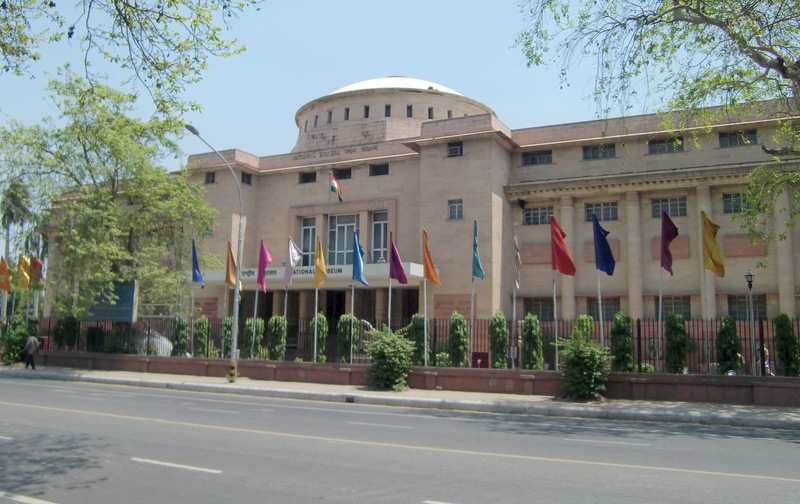 The building has an extensive stamp collection including the first stamp issued in India by the Sindh Dak (1854) and stamps issued before Independence by the rulers of the Princely States. Embassy Lane is situated at Chanakyapuri where you can see the Embassies of the different countries. The road known as Shanti Path is covered with lush green gardens. You can see the national flags of each country. This is one of the architectural marvels of the world. 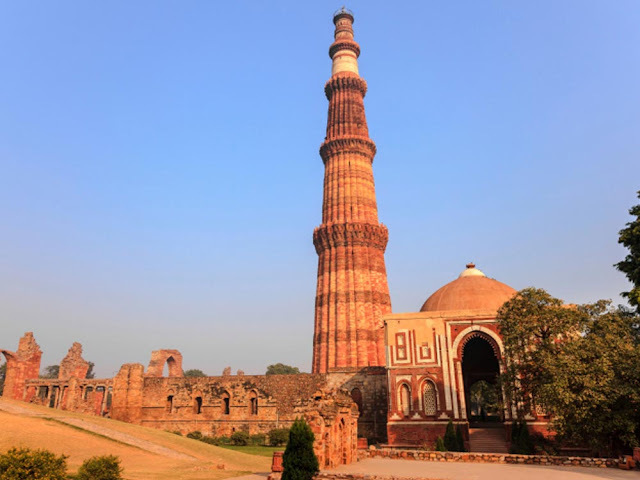 Qutub Minar is one of the most famous tourist destinations in India. The Qutub Minar holds the title for the highest individual tower in the world with a height of 234 feet. It is a World Heritage Site. It is India’s most visited monument attracting around 3.9 million visitors every year. 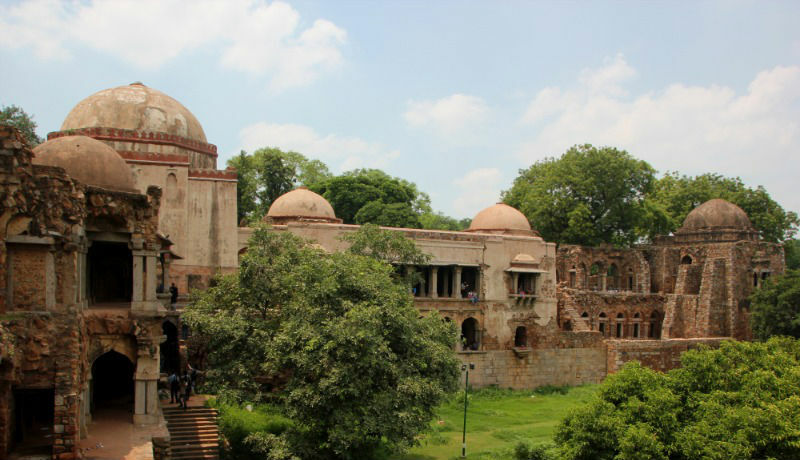 Hauz Khas Village, besides being the hub of designer studios and themed restaurants also has a rich history. All the top designers of the country own a studio at Hauz Khas! 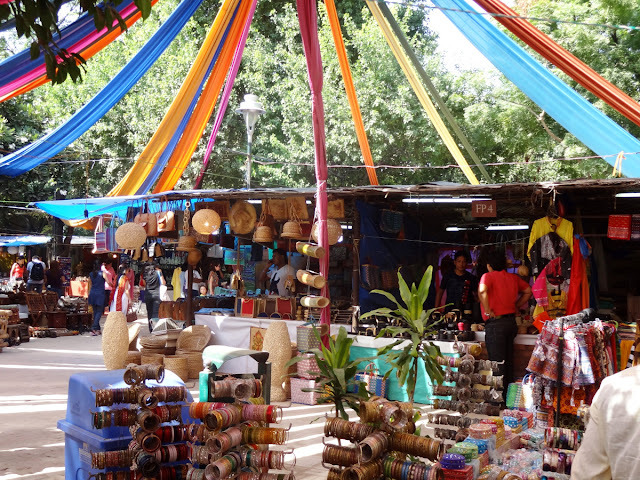 This is the hub for traditional artisans and food. This is a vibrant place throbbing with life. It has 62 stalls and 25 food stalls located within the complex. Craftsmen from different corners of India come over to showcase their products which are reasonably priced. The regional food stalls offer traditional food from all the regions of India. 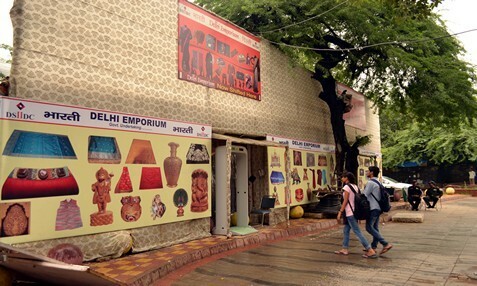 Delhi Haat represents the village style and showcases the richness and diversity of Indian culture and tradition. The National Rail Museum is located in over 10 acres of land with both indoor and outdoor exhibits. The most amazing feature of the rail museum that attracts children as well as train buffs is the toy train. The National Rail Museum educates us about the history of the Indian Railways. It has a collection of over 100 real size exhibits of Indian Railways, The line-up of old coaches includes the handsome Prince of Wales Saloon, built in 1875 and the Mysore’s Saloon built in 1899. The star attraction here is the Fairy Queen, considered to be one of the best preserved steam locomotive engines of her age. The Nehru Memorial Museum was established in the memory of Jawaharlal Nehru and is located in the majestic Teen Murti House. 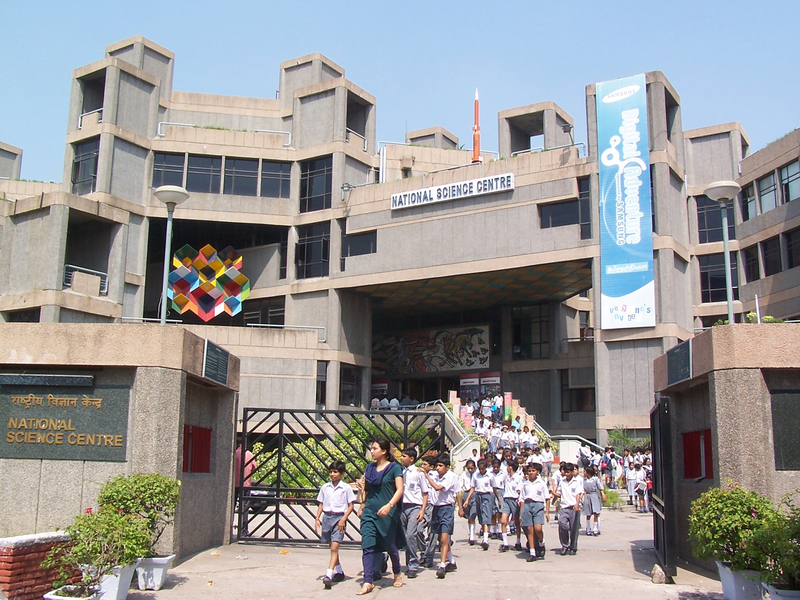 It is divided into four … a Memorial Museum, a Library on modern India, a Centre for Contemporary Studies and a Planetarium. Nehru’s bedroom, the drawing-room and study have been preserved in the way they were used. There is a massive granite rock on the front lawn which has Nehru’s first speech that he delivered on the eve of Independence of India. The National Museum of Delhi is the largest museum in the country. The National Museum displays collection dating back to as far as five thousand years. The National Museum has several galleries. 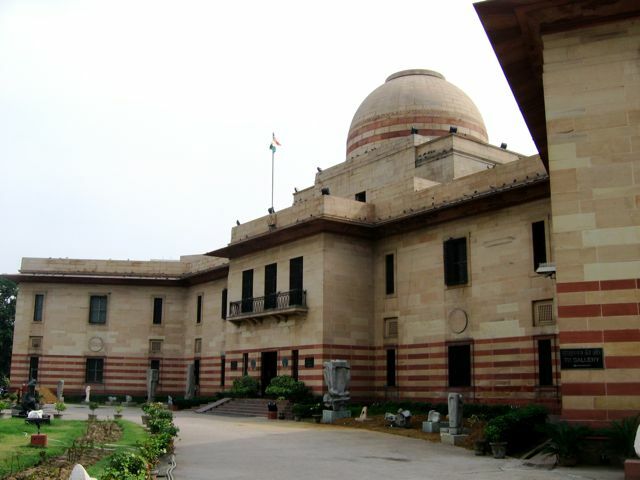 It has the largest collection of artifacts dating to the Indus Valley Civilization. It was inaugurated for the general people on the 5th June, 1978. It possesses over 2, 00,000 works of art and has a prestigious collection of 800 sculptures. The Museum houses working science exhibition as well as exhibits on the history of architecture. It has various sections for all age groups such as Heritage & Dinosaur gallery, Human Biology gallery, Fun Science Library etc. There are also a number of hands-on displays explaining the laws of physics. The Cyberlkool of this museum is the first fun-packed multimedia centre in the country. At least a whole day is required to go through this children’s paradise. This is a treasure-trove of fixed price Made in India handicrafts. Though prices are higher than in the state emporiums, the selection of woodcarvings, jewellery, pottery, papier mâché, jootis, brassware, textiles, beauty products and miniature paintings is superbe! 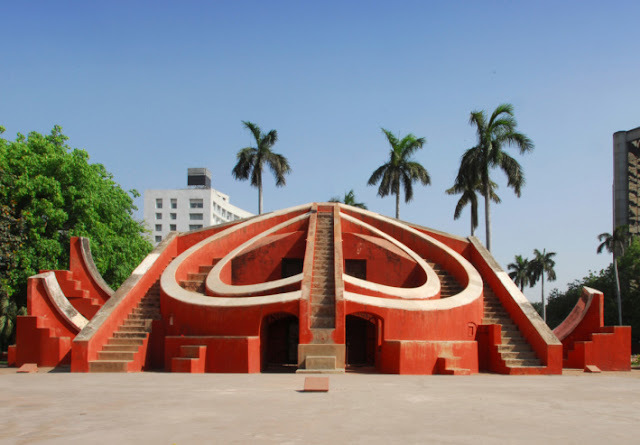 The Jantar Mantar, built by Maharajah Jai Singh II between 1727 and 1734, is a remarkable structure that shows the high level of scientific acumen in Ancient India. It has 5 astronomical observatories, each with a specialized function for astronomical measurement. It consists of geometric devices used for measuring time, forecasting weather changes, predicting behavior of planets and finding extraterrestrial altitude. It is Jantar Mantar is very popular place for tourists as well as the local people. The Jantar Mantar was the logo of the 1982 Asian Games. India has a very rich historical heritage. Each of the places at which the HOHO Bus stops has a story. Enjoy your Delhi Darshan! Nice post.. You show a nice view of Delhi through your post. Great Opportunity for my business modular kitchen designs for small kitchens photos. I need support to approval the comment and reviews some people view our business. DewaZeus merupakan partner dari situs ZeusBola, yg merupakan master agen bandar taruhan judi bola, Casino, Poker, taruhan sabung ayam online S128, CF88 DewaPoker, Live Casino Dealer Resmi Lisensi Filipina Paling Terpercaya di Indonesia, hanya di poker online deposit pulsa. Sbg Perizinan Bola Sbobet Indonesia Terpercaya, ZeusBola telah berkerja sama dengan perseroan Sbobet beroperasi di Asia yang dilisensikan oleh First Cagayan Leisure & Resort Corporation, Manila-Filipina dan di Eropa dilisensikan oleh penaklukan Isle of Man terhadap beroperasi juga sebagai juru taruhan sport sedunia.